A Unique Interactive Show of Canadian Magic, Music and History! AbraCANADAbra is a “very funny”, FAMILY Magic and Illusion Show that works with Canadian history, culture and icons – and your audience – to make an unforgettable, patriotic experience happen! Something Different and Special for Schools, Festivals and Special Events! 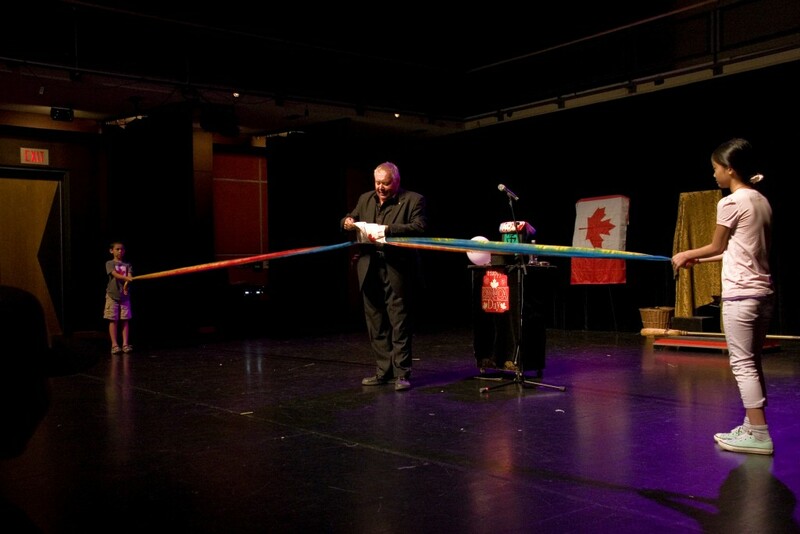 Magic, music, grand illusion, sports, amazing inventions, Canadian folklore and facts, combine with COMPLETE audience interaction (regardless of their age) to create a truly “one-of-a-kind”, hilarious event! AbraCANADAbra – a NEW Show with a One Hundred Fifty Year HISTORY! It’s fast moving, funny, informative and very, very amazing! The first 4 minutes begin with high energy, visual “sleight of hand magic set entirely to music” that incorporates Canadian music and imagery, and some of our furry friends! It makes everyone go WOW! Next with the help of two young audience members we take a flashy and funny, educational tour across Canada (from past to present) concluding with a stage filling, magical production of our Canadian Flag. Again another WOW! From here you will see people floated in thin air, physically transformed, appear and disappear along with some amazing magical demonstrations featuring Canadian inventions, music and sports – again with involvement from everyone in the audience! Incredible, impressive and yet practical – and very user friendly! Designed with a versatile, practical performance footprint this 30 to 45 minute show has been created to “PLAY REALLY BIG” under almost any staging situation (indoors and out). As well different sized options are available to make this show even larger for “grander occasions“, or “more intimate“ for smaller, more challenging presentations. PLUS we even have Special Effects for “Over The Top Magic” like making your Special Host, other Presenters or a Giant, Canadian Birthday Cake Magically APPEAR!! “You did a FABULOUS job! A great mix of Canadian history, music and magical fun! Perfect for the whole family! And your audience interaction was superb. Our Canada Day programming has always been a very challenging type of entertainment slot for us to fill. We need something relevant to the celebration, yet exciting, fun and geared for all ages. AbraCANADAbra really fit the bill. “I just wanted to thank you for the terrific abraCANADAbra magic shows at our annual Canada Day celebration. As you know, we had a wide range of ages and it is often difficult for us to book entertainment that appeals to everyone. I was so happy that your amazing performances kept everyone captivated.